Those of you who know me fairly well might know I have something of a musical inclination. I was in school band from Year 3 until Year 12. While at University, I played in a local brass band that would occasionally march around churches and play at ANZAC Days. It was a great way to hang out with a group of many sweet old men and maybe 2 very lovely women, and they were some good days. 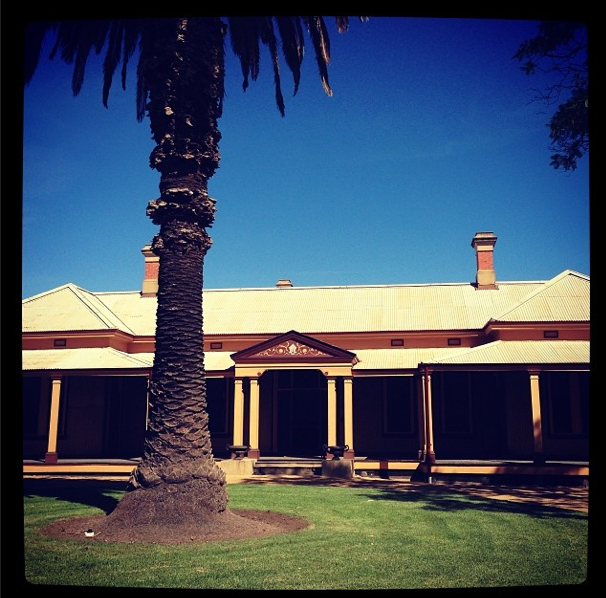 This week I have been working in an outback Riverina town called Deniliquin. Deniliquin boasts many friendly locals, and a lot of sweet senior citizens. One of these was a poet called David, who I met at the Deniliquin Writer’s Group on Monday. David thought I played the ukulele due to some deceptive publicity in the local paper, and I corrected him. I actually play the euphonium. I don’t know if any of you have seen the many-laughs-and-feels Jim Carrey vehicle Yes Man, but basically, this was an invitation I would be crazy to reject. 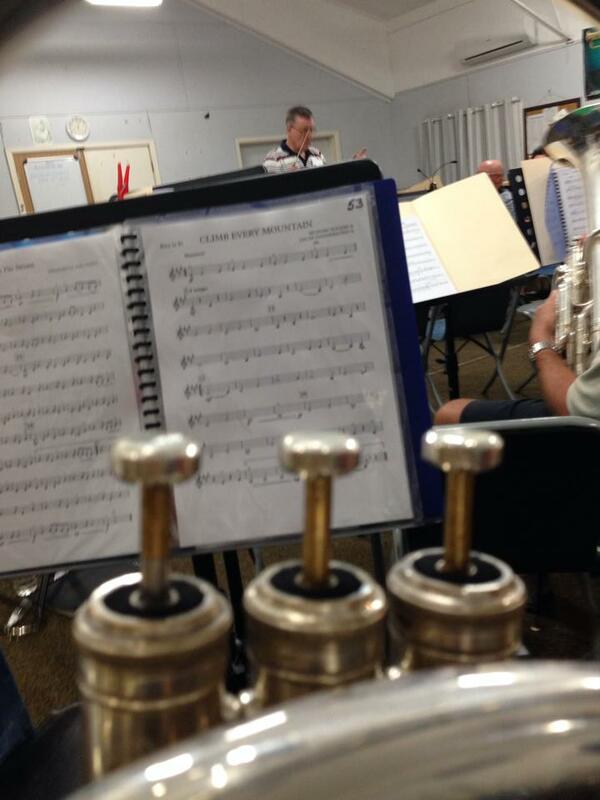 So, at 7pm last night I set off to the Deniliquin Municipal Band practice. I walked in and met the conductor and my band neighbour, John. John is a sweet man who has patented his own tuba seat for band – it has a clever base on it to hold the tuba in place so it’s not too heavy on your legs. I won’t give you any more details in case you try to steal John’s idea. I would not be cool with that. John is a bloke who loves music. He told me that he found it really easy to play the band’s version of “Climb Every Mountain” until the wife eventually sat him down to watch The Sound of Music. Now, he can’t play the song without choking up a little. I sat down awaiting the arrival of my Dead Man’s Eupho and received a rude shock. They didn’t have his eupho. Wherever it went, it wasn’t in the practice hall. The only spare brass instrument available was the biggest effing tuba I’ve ever seen in my life. Important facts: I’ve never played the tuba. It requires an entirely different use of mouth muscles, and perhaps a lesson or two. And I read bass clef, while all the band’s music was treble clef. He was an great conductor. He was okay with the saxophonist’s kids running around in their onesies and with the fact I spent most of rehearsal playing the wrong key signature. At the end of rehearsal, I spent a few minutes checking out historic photos of the band. It has been around since at least 1907. A trombonist named Ron (“SOLDIER ON!”) showed me a photo from 1957 and pointed himself out in the front row. He was 23. Thank you, Deniliquin Municipal Band for a night I will treasure. If anyone’s interested, we have a gig in a fortnight. And with this, Tertia Butcher, Journalist from the Riverina Grazier and descendent of Rotarians, welcomes us to Bishop’s Lodge, Hay, on a sunny Saturday. There’s a roomful of people here for an enrichment program run by the volunteers who manage this heritage venue with an enthusiasm and energy that is inspiring to witness. I think I might be the youngest person in the room – and am already loving the requisite entitlement to be as cheeky as possible – when some of my Year 7 students come in. They’ve volunteered to film some of the day. They beat me in age and in community spirit. I should be deflated, but I’m inspired. On frosty days, we would slide all the way along the wooden slats of the bridge. If there’s one thing I like better than old people with stories, it’s interviewers who know just the right questions to ask these old people with stories so that we get the juiciest memories of time gone by. Luckily, local historian and school teacher Lou Gardam was in charge of running an interview with John and Wal, two men in their 80s who had both lived at Bishop’s Lodge when it was a hostel for boys in the 1940s. They had amazing memories of the hierarchies in place: the Bishop was obviously highest up, made clear by his allocation of marmalade on his toast every day. In order for rural boys to attend the local high school, the Bishop enclosed some of his veranda and made dorm rooms for boys to live in during school term. The dorms only barely insulated from harsh Hay winters, and the showers remained cold throughout the 1940s, but overall it seemed a pretty good life. On weekends, the boys would get free reign to fish in the nearby Murrumbidgee, and would only be harshly disciplined if they stole a noticeable amount of fruit from the neighbours’ trees. The boys were of course required to attend church services at the in-house chapel, sometimes as altar boys. Luckily, Wal dealt with that unwanted responsibility by “knocking off some of the plonk” and getting caught. They also used to eat communion wafer, which I’m sure was delicious. There’s something quite magical about trailing behind a couple of Old Boys in a quiet and subtle enough way that they don’t notice me doing so. I followed John and Wal into the Chapel, where one of the local volunteers, David, happened to be playing Danny Boy on the organ. I’ve had many surreal moments in my life, but not much beats the following. Imagine a small room with very intense acoustics, a stained glass mural bathing the room in red and green light, two 80 year old men rifling through the pages of a 104 year old Bible, with Danny Boy piping through the air, and perhaps you’ve got an idea of what it was like. Having just attended my 10 year high school reunion, I had already noticed how odd it feels to go to your old stomping ground and find that it has changed, and so have you. I remember feeling that parts of the grounds were recognisable, but the paths and the familiar ambling to get to those spots had changed. I’d feel little moments of familiarity, only to have that safety wrenched away. Imagine a 70 year reunion? As if we weren’t excited enough by the first hand memories of Wal and John, we were then allowed some one-on-one time with the extensive archive collection of Bishop’s Lodge. I was particularly drawn to the story of a Bishop who had come out from Australia with his large family, only to have his six month old son die unexpectedly. His letters to his sister back home call the baby “it”. I might only be a wannabe psychologist, but if I can’t recognise “distancing to avoid the inevitable descent into traumatic shock, the sort that’s hard to extricate oneself from” then I’d better hand back my playwright cap. This Bishop was a particularly artistic man. He would draw little sketches for his daughter Mary when he was called away from home to minister further outback. He’d sign letters “your silly old Daddy”. He seemed a sweet man, even to weathered old femo-atheists like myself. Rodents can’t live in a bulk material. It’s like a human in a silo. At one stage, one of the volunteers from Bishop’s Lodge brought up something she had found in the roof of the place. She walked down the aisle between our seats, dangling quite loosely over our heads a heavy-looking wooden contraption. The old boys had no idea what it was, but luckily a very nice and clearly very competent gentleman named Mr Tuckett had time to ruminate over morning tea, and gave us an extremely comprehensive rundown of the device. It was a 19th century insulation tool, used to smooth down sawdust into a dense mass and prevent insect life within the roof. Some of you might wonder how that works? Thanks to Mr Tuckett, I can tell you. Rodents can’t live in a bulk material. It’s like a human in a silo. You get in, and you get stuck. You think, “oh well, I’m stuck, it’s ok. I’ll wait for someone to rescue me.” Wrong. The dense material surrounds you. You start to disperse carbon dioxide amongst the dense material. YOU SUFFOCATE. No possums for Bishop’s Lodge. Oh, forget about the hyrid teas. Do you know what a tea rose is? I sort of do. It’s a form of rose. Did you know it’s controversial? Neither did I. Until I met Coleen. Coleen is a rose expert. She even wears earrings with roses on them and a ring with roses on it and a hat that has an embroidered rose on it. The garden at Bishop’s Lodge is spectacular. There is a ginormous range of roses, some of which are so incredibly perfumed that I forgot all modesty and ego and spent most of our garden tour with head down, bum up, nose inserted into every rose I could find. Coleen mentioned that the rose garden is a special sanctuary for people who have lost those dear to them, or who are experiencing illness. There are benches throughout to sit and think. There is some wild asparagus too. This spectacular garden is one way that a little bit of local history can live on. The plants that the Bishop brought over from England are still alive – still passing on moments of beauty, wonder and solace. That’s pretty special, if you ask me.